Today the Mirage III can only be found in museums. Some of them are in a pitiful condition, due to the fact, that they are stored outside, exposed to the elements. An exception to this is the Mirage-Verein Buochs that today owns two former Luftwaffe Mirage III. The Mirage III RS R-2109 flew a total of 3005 hours for the Luftwaffe from January 1969 until July 2002. The Mirage III RS R-2109 was taken into ownership when the Mirage-Verein Buochs was founded. Later they added J-2313 to their inventory. The R-2109 is in a condition that allows taxying on its own power, but it is not flyable. The aim of the association is to keep the aircraft in this condition as long as possible. To get R-2109 into flying condition again is however impossible as the costs to achieve this goal are much too high. For the maintenance of R-2109 the Mirage-Verein Buochs is able to call on the skills of former technicians of the Luftwaffe. The Buochs Air Base was not only a Mirage III base, but also a maintenance centre for this aircraft. In addition to that, the biggest part of the aircraft was assembled there. Besides the two Mirages the museum houses a lot of equipment and instructional items that were used for training. The museum is housed in the former engine test building. From time to time the Atar 9C engine of the Mirage is test run as well. Such a test happened on the 6th of October 2018. What they showed was the deployment of the Mirage III RS for an A4 take off. For this the aircraft is towed by a Mowag tug to the hardened aircraft shelter U80 by the runway. The pilot is already sitting in the cockpit. 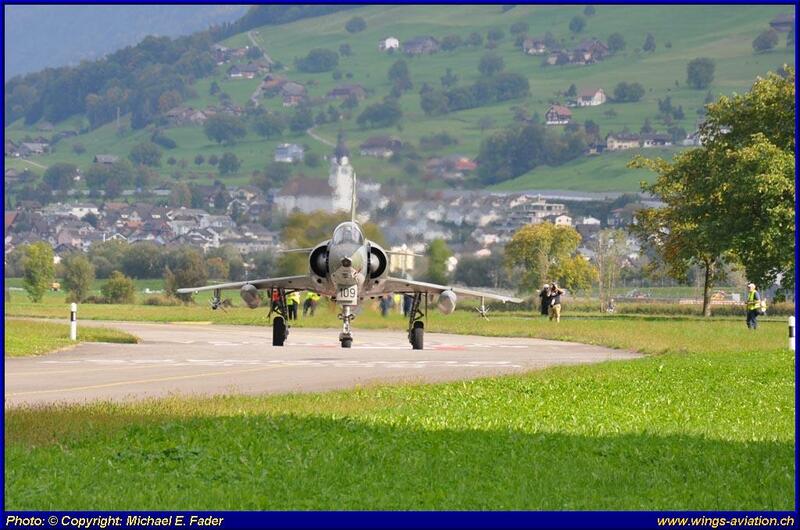 The unusual thing at Buochs Air Base is the fact that they have to cross a main road to get to the runway. As the Mirage III RS is a reconnaissance aircraft, it didn’t do any A4 take offs during its service. That was the task of the interceptor Mirage IIIS. The HAS U80 could not be used as it is rented by private pilots who store their gliders in there. Therefore, the Mirage was placed in front of the closed U80. From their combat order to take off the pilots had 2 Minutes time to get airborne. The Mirage was towed by the Mowag tug from which it received its electrical supply. On receiving the takeoff command, the tug towed the aircraft to the runway. Meanwhile the pilot did his preflight check and while rolling started the engine. On a signal from the pilot the electrical connection and the towbar were disconnected while still in motion. The pilot lined up on the runway and accelerated with full reheat of the Atar 9C engine down the runway. After a third of the runway the pilot interrupted the takeoff and taxied back to the engine test building. As mentioned already the aircraft is no longer in flying condition due to the high costs.